Of course, it’s not simply a Monopoly clone, or I wouldn’t bother to write about it. 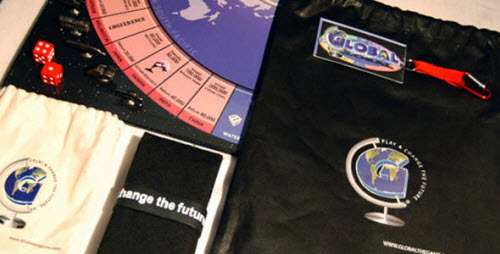 Global, by Jacques Amar and his sggc Teamwork Toys, is a reworking of the Monopoly idea. Roll and move. Invest on spaces; when other players land on that space, they pay you, but they can subsequently invest in the same space. You also occasionally get to bet on the dice outcome or vote on a technology (where all players who vote with the majority win something). The first player to a certain total score is the winner. The threat of player elimination is another central mechanic. Thematically, every space concerns various issues and places having to do with hot environmental topics. Physically, the game is made out of recycled materials with carbon-offsets. However, similar to a DVD game, the game requires a live connection to the web site that handles the dice and random cards. The rest of the website is a vast mishmash of pretty but intensive popup pages, Flash, tons of video, and terminology-laden ad copy. The “demo game” videos are particularly stilted. $40/$50 including free shipping US/internationally.